Featuring the Grande Forge collection from France, which is all about quality, style, and beauty. 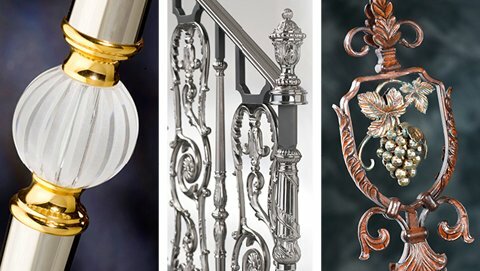 Find an exclusive range of crystal, brass, stainless steel and cast-Iron items that are blended with precious objects to create unique designs for stair railings and balustrades. Grande Forge also makes 24-carat gilded products keeping in mind the regal taste of the elites. These luxurious collections are designed for giving your space a contemporary look that is sophisticated and stylish. A high-fashion finish and the touch of perfectionism that our products carry will enhance the overall look of your house.